Ever Consider Becoming a Professional Business Broker? America is experiencing the largest and most pronounced cycle of retirements in our nation's history. The Baby Boomer Generation has more than thirty-five million members of this group that has started reaching retirement age. The Baby Boomer Generation includes those Americans born soon after World War II, starting in 1945 to 1964; a continuous period of approximately twenty years! Many in this group are now selling their business, collecting the proceeds and investing in the next phase of their life. In fact, this activity is a primary reason highly trained and skilled Business Brokers are in such high demand. Additionally, the children of the "Baby Boomer Generation", the Generation X'ers will begin retiring immediately on the heels of their parents. This group is even larger than the Baby Boomer Generation. The back to back retirement of these large groups represent a historical occurrence in the lives of all Americans. This realignment of important lifestyle events and personal wealth for the Baby Boomer Generation and the Generation X'ers will likely continue to the middle of this century and possibly even longer; a period of about fifty years and beyond. Business brokering can be a financially lucrative business for the right people with the right training and guidance. Now is an excellent time to become a BBN Affiliate Member Business Broker. For more information about the BBN Opportunity, please use the Career Contact Form by clicking here. Experienced and Educated Retired and Non-Retired Individuals with Business Management and/or Business Ownership capabilities describes many current and successful Affiliation Members at Business Brokers Network (BBN). Since 1981, BBN’s Owners and Management Group have observed that individuals retiring or “Down-Sizing” from corporate America often possess key business skills and knowledge that allows them to transition successfully into Professional Business Brokers. Business Brokers Network (BBN) is proud of the fact that we are “Home to America’s Best Trained Business Brokers”. 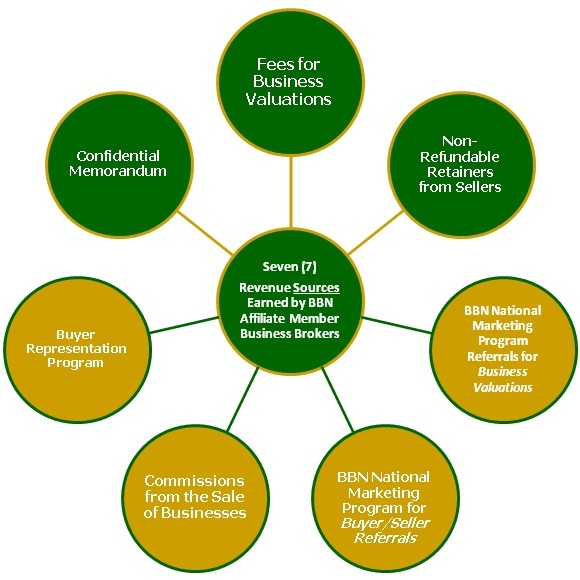 Business Brokering is the type profession that allows Selected BBN Affiliation Members to become Successful Business Brokers and the Opportunity to Utilize Your Specific Business Skills Developed Providing Similar Services to Employers. Business Brokers Network (BBN) has Successfully Recruited, Trained and Serviced Over One-Thousand Individuals Since 1981. We are also proud to report that many of these individuals have continued to be active and successful BBN Affiliation Member Business Brokers for twenty-years and longer. Downsized? Motivated? Ambitious? Too Much Travel? More Family Time? In Need of a Lifestyle Change? Work From Your Home or an Office…It's Your Choice! No Geographical Restrictions. You go wherever the deal requires! BBN Affiliation Member Business Broker? How to get their business Sold and Closed! As a New Affiliation Member Business Broker, you are positioned in the most lucrative segment of the business brokerage industry from the start…You bring a distinct advantage to your clients as you will be a part of One of America’s Largest Network of Business Brokers! Access to BBN’s Software templates that Transform Business Information into "Informative Business Profiles"
DO YOU QUALIFY TO JOIN BUSINESS BROKERS NETWORK (BBN)? Usually, individuals-near-age-fifty-five or older are the most likely to be in position financially to afford to work as a Professional Business Broker. Prospective candidates need to already enjoy the benefits of a reliable income, either in the form of a retirement pension such as Social Security Income) or a spouse or other family member with dependable income. BBN Affiliation Members are Trained to Deliver Substantial Value to Clients. Fees earned between Closings and Commissions Collected at Closings are Equally Valuable. Closings for business sales after a contract is signed takes several months. Buying a Business is a Large Expenditure and most of the money paid is usually borrowed from a bank or other business acquisition lender. Also, Buyer’s Due Diligence can often delay the process unexpectedly and extend closing dates. HOW MUCH MONEY DO BBN AFFILIATION MEMBERS EARN? From an economic view-point, Business Brokers Network (BBN) is equally proud to report that our Professional Trained BBN Affiliation Members are recognized within our industry as among its Best Paid Business Brokers, primarily because Business Brokers Network (BBN) provides On-Going Training including Approaches and Techniques to all Active BBN Affiliation Members to Sell Significantly Larger Businesses than the Industry Average. BBN Affiliation Members Sell Businesses for Selling Prices that Average Approximately Four-to-Five-Times-Larger than the Average Selling Price for All Business Brokers Nationally. For BBN Affiliation Member Business Brokers, compensation is as much a function of knowing which businesses not to attempt to sell as it is knowing which businesses are the most sellable. Business Brokers Network’s (BBN) Management Personnel know that the average business size our Affiliation Members List and Sell has increased steadily during the immediate past ten-years. In fact, some BBN Affiliation Members have earned seven-figure annual compensation amounts in some years and even more BBN Affiliation Members have earned upper six-figure annual compensation amounts in some years.